Use of Methyl Bromide (MeBr) has been banned in most developed countries since 2007. From January 1st 2015, it is not available anywhere as a fumigant for flour mills and other industries. 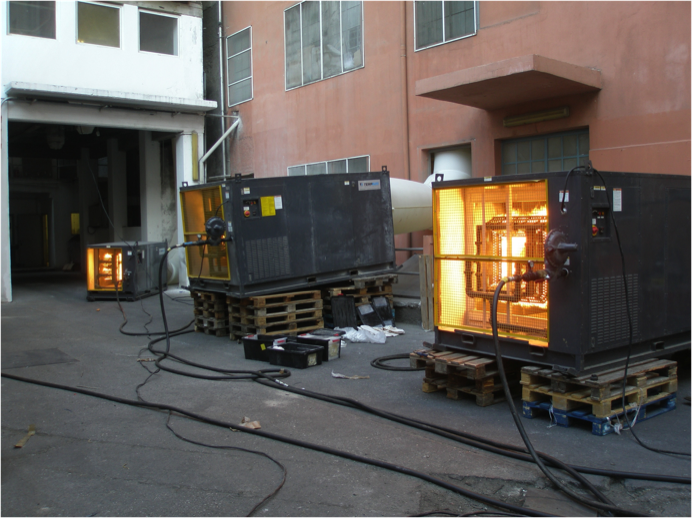 Several fumigation alternatives have been tried around the world with heat treatment being one of them. But how good are these compared to good old MeBr? Can such alternatives be used for precise fumigation, i.e. a tightly controlled and monitored fumigation process? Methyl Bromide has been a good fumigant, but not excellent since the main disadvantage of gas fumigants is that they need airtight buildings. And in the real world, very few buildings are made airtight or can become airtight with proper sealing work. The majority of buildings will never hold the gas, especially on a windy day or when there are significant temperature differences between day and night. 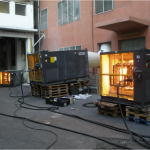 Heat treatment has been practiced worldwide for a few years and is by now deemed a very effective replacement of MeBr for structural fumigation. Insects die at temperatures above 50oC because the proteins in their bodies coagulate, their salt equilibrium becomes damaged and they dry out. All insect stages are affected and no resistance to heat has been observed in the lab or in the field. Electricity, gas, petrol and steam can be used to generate heat for insect extermination. In our work, we have found out that each type of heater has its plusses and minuses. Electrical heaters (Photo 1) are easy to use, easy to handle and efficient; but they cannot be used to treat an empty concrete silo (you need a gas heater for that, with a long ductwork). Gas heaters (Photo 2) need to be placed outside the building, so for high buildings you may need to lift heaters by crane to the top floor. 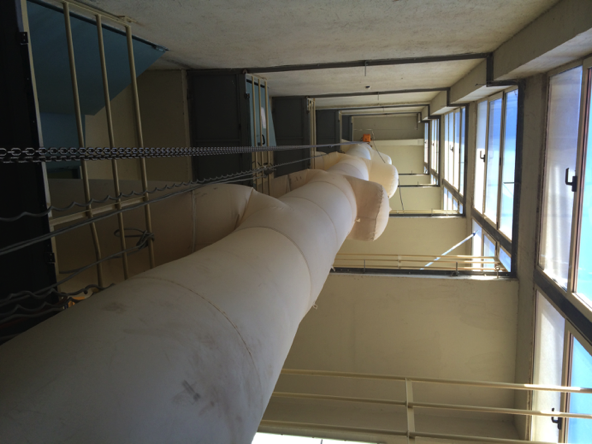 In most of the cases, the use of special air ducts through available shafts enables us to treat several floors and sections of a mill at the same time (Photo 3). In comparing recycling of air (electrical heaters placed inside the building) with introduction of new air (gas heaters placed outside), we found out that the increase of pressure in the latter case helps the hot air to enter cracks and crevices. In practice, the merits of electrical and gas heaters can be combined, using both types to treat large mills with speed and efficiency. No sealing required. A main operational advantage of heat is that it does not need any sealing at all. In fact, when new hot air is introduced in a building we need to leave a top floor window partly open to avoid the increase of internal pressure. Heat treatment is fast. 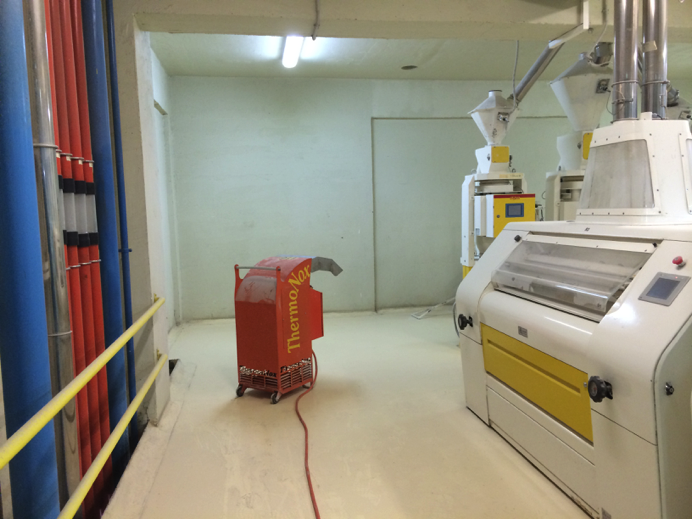 Proper cleaning of the mill area to be treated is needed, but since no sealing is required preparation time is minimal. With the right equipment, an experienced team will need slightly more than 24 hours to treat a building. 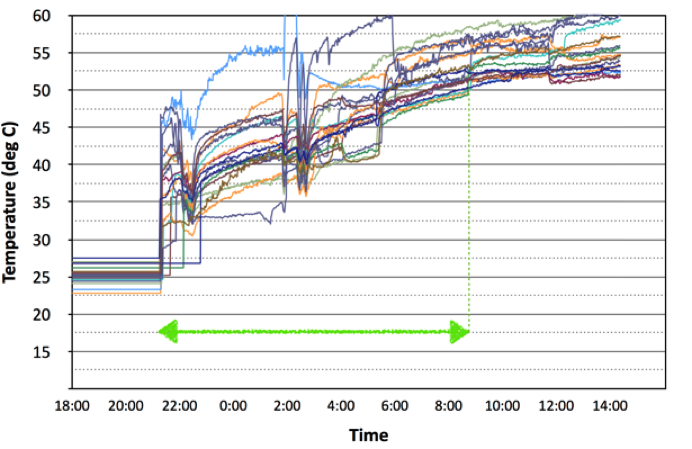 In Diagram 1, temperatures are plotted from various sensors inside a mill during a heat treatment; as can be seen, lethal temperature levels are reached in less than 12 hours. If these levels are maintained for about 12 to 16 hours, complete extermination of all insect stages (including larvae and eggs) is guaranteed with high statistical probability . Downtime for the mill is really short, especially since an area of a large mill may be under treatment while an adjacent isolated area remains operational. Safety. Heat is totally safe for people and the environment. Workers can work next door to a heat-treated area, or can even enter for a short time an area during heat treatment. 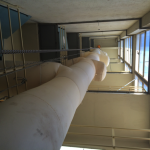 By contrast, a gas fumigation requires a safety zone around each building under treatment, needs several hours of aeration and a professional gas inspection before workers can enter. With all gas fumigants from Methyl Bromide to Profume you need several sampling points to measure concentration precisely. You may have 2, 3, or even 10 sampling points per floor if you are really well organized. With heat, you may have for instance 10 temperature sensors per floor, but you can also enter the building during the treatment and use an infrared thermometer to check literally thousand points per floor. This means unparalleled precision! Our team is performing a large number of heat treatments each season, most of them in flour mills and food processing factories. For precision monitoring and effective remote supervision, we are using the therminate.comsolution  that we have jointly developed with Centaur Technologies (Volos, Greece). 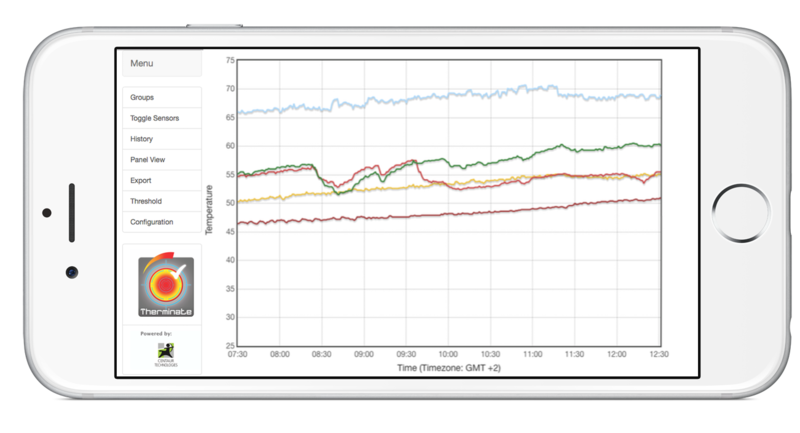 This is a cloud-based service that allows remote monitoring of heat treatments from a smartphone or computer (Photo 4). 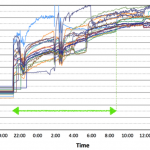 Temperatures are collected from wireless sensors that provide good coverage even inside concrete buildings and silos, and connect to the therminate.com cloud system via a wireless gateway. Treatment durations and kill statistics are reported, and alarms are issued whenever something requires attention (e.g. a temperature level exceeding safe limits). This allows our team to effortlessly and safely drive the process to eventual success. A heat treatment with good equipment and an experienced team can never be a failure. But assuming a corner of a building is left under-treated, for whatever reason, you may extend the treatment in that corner only to cure the problem. 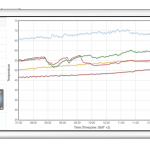 The unique advantages of multi-point monitoring, along with the option to perform incremental or extended treatments, give heat treatment its highly precise character. B. Subramanyam et al., “Heat treatment of grain-processing facilities for insect management: a historical overview and recent advances”, Stewart Postharvest Review, 2011.